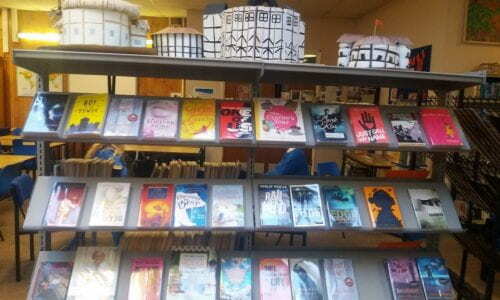 School Librarian Sarah Seddon wrote this article about the excellent practice in her school. I feel compelled to write this article because of all the negative publicity and media attention that school libraries have received recently. Many schools do not have libraries or may have a library which is not run by qualified staff. Our school library is not unique, but it is one of the fortunate ones. I have been running the library at Piggott School for just over two years now, and my predecessor was here for 10 years prior to that. As soon as she announced her plan to retire, plans were put in place to employ a Chartered Librarian as her replacement; a like for like replacement was assumed and happened. I have a part-time Library Assistant who works for 12 hours a week, and I believe that this post has existed for some years now. Piggott is a mixed state comprehensive school with a Primary site which is quite new, so at the moment the top class is Year 3. Eventually Piggott will be a complete through school from Reception to VI Form. Our Primary School is in a different village over 2 miles away, so we have two separate libraries. In this article I shall mainly be talking about our main secondary school library; I shall talk about the Primary library in the second half of my article. The library is in the English block and is traditional in that we have shelves of fiction, non-fiction and reference books, as well as a good range of general interest magazines, daily broadsheets and A Level Journals. We have about 30 PCs in the library for use for homework and lessons. Our fiction is definitely more heavily used than the non-fiction, although I do have a number of requests for class topic boxes for lessons in various curriculum areas. We have a reading culture in our school, with a big emphasis on reading for pleasure, extended into reading for a wider world view. We do use the Accelerated Reader system with Years 7 and 8, and this, as with any Reading scheme, has pros and cons. I inherited the system and on the whole feel that it is a positive move and that it particularly benefits reluctant readers and those with a reading age lower than their chronological age. I can produce detailed reports for English teachers and LSAs on reading habits and progress and advancement in reading ages. The headteacher is wholeheartedly in support of a well-resourced library being at the heart of education, and backs this up by providing adequate funding for resources – not only books and journals, but also funding for book-related trips and for author/poet visits annually. I am confident that I can purchase books and materials when requested by students and staff. Staff at Piggott take the library for granted in the best kind of way; they expect it to be there for them and are in the habit of asking for resources for lessons and booking the library for classes to use computers and books. The Duty Teacher system which extends to the library enforces this culture. Before school, at break-time and lunch-time there is a member of the teaching staff on duty to help support the students and manage behaviour. In addition, members of the Senior Leadership Team regularly come over at break-times to support staff in managing behaviour. After school, another teacher runs a homework club in the library, thus providing more support. A key factor in this system is that teachers other than those from the English Department are on duty in the library and come to see its value. All students in Years 7, 8 and 9 have an English lesson in the library once a fortnight. Year 10 classes also have a pencilled-in slot which they can use if they need to. These lessons are used mainly for silent reading, changing library books and taking part in extension activities run by me as the librarian. The library is open Monday-Friday from 8:00-4:00. Up to about 70 students may come to the library before school, some working at computers, some reading books, magazines or newspapers, and others doing homework at tables using pen and paper. It is a lively, happy atmosphere and most of the students are regular visitors and have particular seats where they like to sit and work. I think that if I were to take a photo of them every morning, it would be surprisingly similar each day! At about 8:30 the Duty Teacher arrives to assist with managing such a diverse group of students. Some mornings there is a reading slot in morning registration, so many students come in to choose a new book. I ring an early warning bell five minutes before the morning bell rings for registration. On Thursday and Friday mornings Reading Buddies meet in the library in morning registration. Year 10 students are paired up with Year 7 and 8 students to listen to them read. Students needing this support are identified by the responsible English teacher. Throughout the day classes from Years 7-9 come in for their fortnightly library lesson. My busiest days are with four out of the five timetabled lessons booked for a class. These lessons are quite varied, and I am more involved with the Year 7s and 8s than with the Year 9s. Students may change their books, and some may ask for advice and recommendations. I am particularly busy on Fridays, as my Library Assistant is not in school. I therefore deal with all book issuing and queries, as well as running any class activities with Years 7 and 8. I may need to produce Accelerated Reader reports for the teacher, or support the teacher in tracking reading progress and checking reading logs. Some teachers ask me to run an extension activity, which could be anything from shadowing Carnegie or Greenaway, selecting books for our Berkshire Book Award long or shortlist, to Speed Dating with books, Desert Island Books, making Shakespearean Insult posters or tweeting an author. 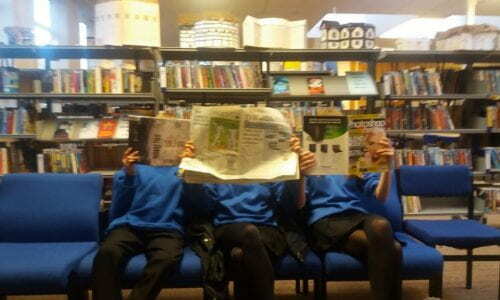 Otherwise many of the library lessons are silent reading for the whole hour. The library is always open to other students and staff during library lessons. A few VI formers may come over to use computers or study space if their own study area is full. LSAs assigned to the English department work one-to-one with students needing support with reading. They monitor students in Years 7 and 8 needing intervention and help them to choose their library books. Teachers who need to mentor students either one-to-one or in a group also use the library. We have enough desk and computer space for a class of 30 and other students working in the library at the same time. When it comes to level of noise in the library, priority is given to the booked class. So if I am running a Speed Dating session, it will necessarily be a little more lively than a quiet reading class. Whilst all this is going on, other students may come in to change their library books. At break and lunch-times the library is open to all students for homework, reading and book borrowing. As with the before school session, the students who come in are often the same ones who come every day. With all the talk of libraries closing and young people not having access to books and information, I am proud to run a library which many of our students visit almost every day of the term. On Thursdays I run a Book Club at lunch-time, but this takes place in a nearby classroom, to enable us to have a quieter atmosphere and also so that I can allow the children to bring their lunch with them; lunch-time activities can be very time-constrained, as our lunch-time is only for half an hour. Most of my members are from Year 7, although the group is open to all students in school. We do not read a set book recommended by me. Sometimes we discuss the Greenaway and Carnegie books, vote on books for our local Berkshire Book Award, make displays for the library or just share our current reading with the rest of the group. I was able to take members of the group this term to the launch event for the Berkshire Book Award, at a nearby school. Our after school session is the quietest one of the free access sessions. Homework support is on offer from the teacher in charge, and I am also able to offer support or students may want to borrow books. We may cater for anything from half a dozen to 30 students after school. We are open for an hour at the end of the school day. On Fridays I am the only one on duty after school and it is usually quieter just before the weekend. Our Primary site is in Charvil, in a building just a few years old. The library is well stocked and pupils there can borrow books and take them home. Teaching staff and Teaching Assistants deal with the day to day book issuing and library visits. I visit the school at least once a fortnight, sometimes weekly, and spend half of my time with one class, the other half tidying up and putting out any new books that I have brought over. The children seem to really enjoy the visits. I see the class in two sessions, so that we can enjoy some stories and then make something new for the display board. The library is at that stage where everything is still very pristine and new, and is really well stocked with picture books, information books and some more advanced fiction for when the children are ready for it. What else is so good about our School Libraries? Our students do love reading and have their favourite authors. We reserve books for them, and regularly take requests for book purchases. I have never had to refuse a request for a book either from a member of staff or a student. I think it is important that the library is relevant for the whole community and that the students’ requests will be fulfilled. When it comes to following book awards, I buy multiple copies of the short-listed books, so that we can use them for class and Book Club activities, and also so that we can circulate them more quickly and ask students to write reviews for Twitter and dedicated websites. Once a year I organise a visit from an author or poet, who will come for the day to give talks and workshops to targeted Year Groups along with a book sale and book signing opportunities. We love to celebrate books and have fun with them, so we make special occasion days of National Poetry Day and World Book Day. For WBD Year 7 and 8 students and some staff dress up for the day to get into the festive mood. Activities will include a themed cake sale in aid of Book Aid International, a visit from the local press, special class activities and competitions. Last year in advance of the day, two classes also prepared an entry for the WBD competition on the theme of: Where does your reading take you? Our entry was in the form of balloons. We did not win the competition, but had a lot of fun taking part. Sometimes the library will be used as part of Activities Day. We have had a Year 8 group making posters on the theme of the environment, using books and resources in the library. More recently I ran a small group activity for Key Stage 3 on the theme of words. We played games and researched new words using dictionaries and other resources. We have lots of artwork on display by students. There is a collection of Shakespeare’s Globe models which Key Stage 3 students make, and these are changed each year and displayed on top of the book-cases. 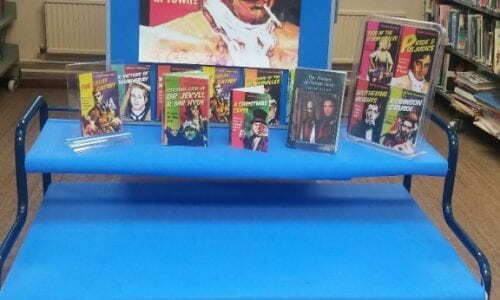 We also create regular themed displays to promote areas of the stock, themes and seasons and new books. We have a Book Fair every year in November, leading up to Christmas. This creates a real buzz and gets more students into the library. Our library is at the heart of the school, and although we are closely linked to the English department we are relevant to all school departments, and everyone knows where we are. The library is a room with resources in, as well as being a useful space which is flexible enough for a variety of activities. I am confident though that the most value is gained from having a qualified librarian, a well-trained and committed library assistant, and teaching and other staff who completely take ownership of their library and could not imagine their school without this valuable resource.